உன்னை பாடிடாத மொழி ஏதும் உண்டா நினைத்திட? தன் குரலால் தனித்து நிற்க்கும் சிறப்பாக. குழல் ஒலியைவிட இனிமையானது இதன் குறல். is there any language lack singing u to think? its vocal is more sweaters than flute sound. 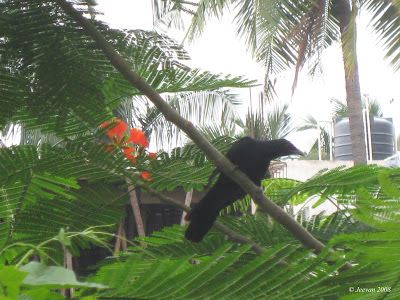 "The bird in the picture is not crow, its The Asian Koel clicked near my home." It’s time to remember chennaities, the season to celebrate the discovery of a city belong to 369 year-old. Calls it Madras Day or Week, at least to keep remain on this time calling in the origin name still exist worldwide, even though we rename it as Chennai. So many programs are carried on celebrating the event for the last 4years, ‘The Madras Week’ helps displaying the history and heritage specialty about our city in raising awareness among people, there are much facts going through online and newspapers with a separate column with old pictures. And I thought to do something different, and then came this idea of writing my own inhabitant location Adyar. This is one important area in Chennai to remain, if not for any historical, I think it has something special to mention and to its name to have a share in the city’s development. Adyar is an elegant area in Chennai, which begins its development in early 70s and the recent development witness the ever raise of apartment complexes and high rental rates, what makes feel burden the people after IT’s caught up. And getting a home in this area is dream for many and opulent could only make it possible. Adyar is the gateway to the southern suburbs and IT corridor which bears the top most IT parks and ECR, the travelers enthusiastic. Adyar is the remaining locality of greenery in Chennai borders with Adyar River and Buckingham Canal. The world headquarters of Theosophical Society located here on the bank of Adyar Estuary and forest, which shelters for many species of birds and trees is a gifted environment for nature lovers and what it provides a tranquil is unique to a noisy and spread pollute city. 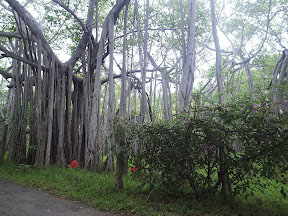 And people come here particularly to sight the very-old Banyan tree, and later people spell it as adyar big tree. The two main roads that essential part of people is the Lattice Bridge Road (LB Road) and Sardar Patel Road, which holds the country top institutions like IIT-Madras, Anna University of technology, Adyar Cancer Institute and the world largest leather research institute. And these two roads are worth in recent period for heavy Passage of vehicles; remain connecting with its neighborhood areas and its central place or meeting point of roads known as Adyar signal, which had a face-lift by the construction of two way flyover. The larger area of the Adyar signal put names for some forefront and long lasting in this location. To refer few are the Ganesh temple to its north, existing for more that 50 years or so remembered by people and being renowned general among locals. Being a son of one regular visitor to this temple, the memories spread every nook of this temple, served to be one place to visit at every particular time with family. The Anantha Padmanabhaswami temple in 2nd main road of Gandhi Nagar is one often checked by people, and it remains serene for a pleasant stable, and being a child, visiting this temple is kept unknown spirit. These days I wonder where lost the calmness, looking at the stretching queues outside the temple. To mark next is the Adyar Park in northeast, well-known by locals as Aavin Park, which have an aavin ice-cream parlor, and once been a pasture garden and children play area still remains with lack of renovation, but in the development of roads its existence wonders. Thus located in corner of the signal, it may name Hotel Coronet, but decades back it was originally called as Hotel Besant, famous for its vegetarian cuisine but still serves as a non-veg in compete with other stylish cuisine restaurants and is one oldest landmark in Adyar. 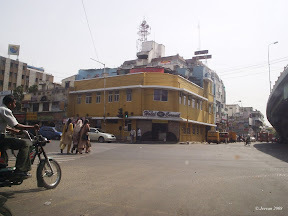 In 1950s there was this Karkathamman Hindu Military Hotel run by Mr.P.Venu is the only non-veg hotel in this location and famous for its spice turkey biriyani prepared at every Sunday. Adyar have the quality when it comes to taste, whatever u buy from sweets to snacks ‘Adyar Ananda Bhavan’ is the leading store in the city completes with savory. It developed into 31 branches throughout Tamil Nadu and neighborhood states including New Delhi taking the name along with serving sweet. There is another flavor place and more special about it is home made sweets and snacks prepared in gee, ‘The Grand Sweets’ in Gandhi Nagar Adyar is only place let you. Adyar is also famous for its candy and cakes, brought from Adyar bakery places at birthday celebrations at homes, and parties, again the quality and hygienic brings people from far ever places or near by its branches to get the best. 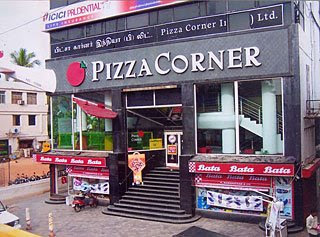 The Pizza Corner in LB Road is a place easily attracted by young people to taste something new. The construction itself seems different as if some flight crashed into the building. There were two movie theaters in Adyar; one was very famous called by Eras which was turned into a marriage hall later and into Mitsubishi showroom a decade back and the other one is Ganapathiram Theatre still exist. 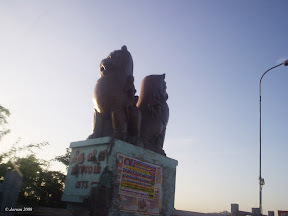 The Periyapalayathu Amman Temple in LB Road is most popular goddess temple in Adyar, and its major celebration is Aadi festival which comes in month of July-August. The mosque oppose to the temple is very older which is frequently followed by Muslims and regular prayers are conducted every day, in silence one could hear the breath of people calling alla hu akbar. The nearby bus depot is one big stand for city busses to park and service with latest machineries, to stop along receives busses for all places in Chennai and outer. To add one more is the old Adyar Bridge constructed in British period which was in transportation and in working condition till the arrival of a new one. Today it carries the burden of advertisement banners and involved in corrosive by salt wind and small plants. The new ThiruViKa Bridge build in 1973 help people for enough travel and in recent times its worth witnessing the trail of heavy traffic flow throughout morning and evening in its half-km stretch. And there is another bridge near the mouth of Adyar River which is more that a km length helped people to come across the river in two wheelers then, thus it was broken into half because of the hurricane; it gives way to shooting films these days and sometimes its damn insecure being there. In education, residents of adyar holds some best schools like St.Johns, Bharath, Bala Vidya Mandir… and am really happy to do from one of these schools and I could proudly tell am an old student of Bharath Senior Secondary School. Somehow I feel you may get some idea about my area (enga area ulla vanga :) Last but not least. There are so many changes happening from time to time and something come flowing in mind about my location, let me update something frequently and whatever it may; more or less I love my place Chennai! 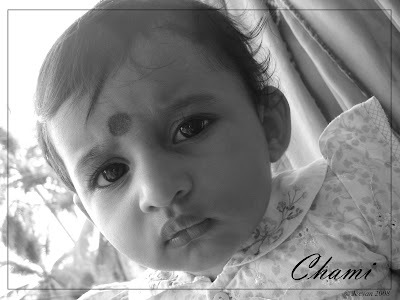 The sweet chami is my uncle venkat’s daughter and the smart Sachin is uncle senthil’s son. Chami is someone being very quite from other kids, and she smiles unique. 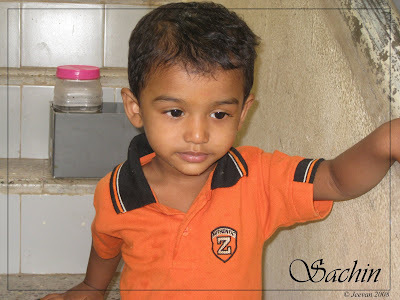 Sachin is pretty support for any snap and he will smile cute, but he refuses when giving pose. Last weekend I was again to my native home, according to my promise made to cousin as per there visit to my home the week before I was. It was something being together couples of years back getting to this apartment life, what never felt is so close. I remember people telling ‘being nearer, rarity unknown, just making the thought true the relation between me and cousins. Being away in distance shows how much we miss each others sharing, loving and helpfulness, but every wish is not possible isn’t it. If I can live on myself, I can go with there wishes, but sometimes more than desires it’s the comfort and easiness decides our life. Again they raise the topic of returning back to native, thus it’s impossible, though I somehow manage to give them vow to get rented any near home that comforts me. The time passes easily with nothing to beat boredom, the life moves along people passing like clouds, new pretty wagons on road the views from balcony completes my time. The forgotten games where played, taking different pictures from object to lives, lived the moment to give and take pleasure, but there is little sense that people expect from me, without understanding my experiment. But I never take it series and thought to see them apart, thus I want to remove the tine line between our relations dividing the insight mind alike the line between sea and sky. It was the life came across many misunderstanding and still continues more kindly is because of the love we young people share each other. Its long time wish bringing our nuclear families into mutual family, but I must indicate the thin line lacks become real this. I wish the understanding beings us together and hope it brought together. The one, who chained the opponents into faction, is what unchained now. The ball is thrown out of the game, but there is something like who wins the game is chaos. The faction will lead the game without fracturing? 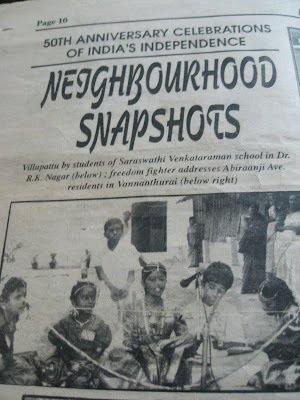 Casually one day I come across this decade old news paper which I saved sometimes back, that have my picture taken from my school’s Independence Day program. It was the only cultural program so far I have participated that could be particularly on India’s 50th Independence Day celebration at my school. Normally being shy to appear before crowd, I always lack raising hand when a circular comes in registering name for those like to participate in annual and Independence Day celebration. One time teacher added my name and knowing am not interested, but getting permission from mom made me take part in Villu paatu. I feared how come talking and singing before many for first time and thought to be withdrawing, but our teacher and principal encourage me to partake as it would be nice making all students involvement. So i was asked to come in traditional wearing of dhoti and white shirt, and girls in silk skirt and shirt. Our team was lead by friend kavitha; me and mate senthi with some junior class students’ as chorus, our story rolled with question and answers about freedom leaders and their struggle as a song. Reached sometime by 6 in morning, unusual being so earlier get prepared myself with dialogues and wearing dad’s dhoti, tension climbs as time nearing. Adding, mom left home leaving me at campus and sent aunt to look-over the program and bringing me home. It was something like wording ‘thanthanathom endru solliyea villinil paada, amma villinil paada…’ at every end of the piece of information on freedom. They have given the chorus a two piece of metal known as ‘chingchak’ and giving away the bow tied with bells beaten with a stick to kavitha. Truly what we have singed then is out of remember now, only the scenes remain. I was carried in a chair to the ground by my friends and teachers courage to do better. Eyes searched for family face, none found in what in between me missing some lines that unnoticed in the long run story. In conclude it was proud to get applauds what gives a feel out of cage and what carried on in walk is pride. It happens to be one special moment in my life. As said by some the patriot and national pride least when one is out of their school. But for me is more been out of school, the meaning of being a nation proud and what I am doing is nothing for my nation. Having freedoms to think, to look in my wishes but not really working in desires and in mass uselessly pass by. What is freedom? Who could work on his interest, to live on what is given, fearless to be true, is what the freedom I realize for myself. Is the pain and struggle only the fighters sense, but audience, they watch and feel happy when there fighter wins, express sorrow and disappoint when they lose. The fighters I like to mention her are my parent, if not them where is my freedom, first parents then the patriot. It was another day in my life, my b’day on the last day of last month. Nothing special to write, but as per thinking recent past it went simply just like that, to be wished my beloved ones. I feel more than wealth, is the warmth what comes from heart as words and caresses pleasures more. The morn waked down through dad’s embrace and kiss continued by mom, and with uncle, aunt and cousins wish completed my 23years. 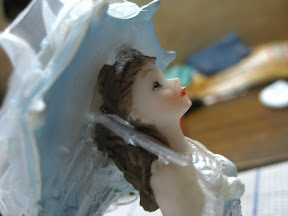 My sis brought me this present to let me guess, with no idea her mind thinking sweet, giving me this little angel doll. Uncle’s kid with box of celebration chocolate completes the day with his smile. Something I really feel worth, for not what they give me, to be sharing the moment there. Those days it’s been a habit of sharing chocolates with neighbors and friends, after life changes it have been stopped, but this time mom gave sweets to the children of our neighbors. Someone will remain my existence on this day. Thanks so much dear friends for remembering my B’day and wished me through e-mails and scrapping orkut, the days am away from here. 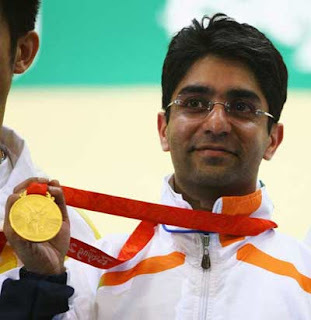 Its Glories moment of morning for India to won its first ever individual gold medal at Olympics, by World Champion Abhinav Bindra winning at 10m air rifle shooting event. Now India shines with gold in the globe, creating history by its own country. It’s a very great horror as citizen of India to Congrats him and let it be a beginning for India to won more medals. 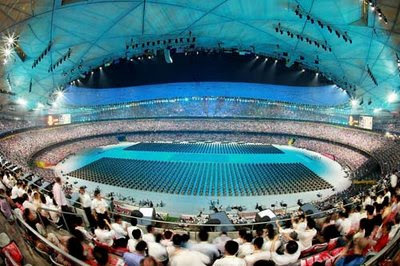 It’s the bird’s nest I have ever watched the entire opening ceremony of the Olympics. There is no less in the expectation the progress given by Chinese for us the excitement. As the count down beings with their traditional drum beats the whole attention went on how the sparkle going to spring for the eyes of world. The Chinese showcased their rich art and talent in there colorful programs that in amusing way. It’s their real show that could not imagine those are not graphic animations. Whatever the technology grows, something creative by mind and performed by people always remain special, I see this in that way. I was put in adore at each performance and wonder at the magic like on television, without magicians, mean more than their face, hides behind stand in unity for there pride to make perfect. The dancer above the sheet carried by seemed like a pretty young chick inside the nest trying to swing it wings, and the light coated dancers and the moving animation like performed in figures was excellent. It was unexpected when our Indian team will enter nest, and it’s atypical to entire order from any other to arrangement of Chinese scripting. Winning or losing is not the matter, but being the second much populated country in world, it’s miserable to see only few Indian sports men/women partake in the event and parade, comparing to small countries with many sportsmen. We aren’t possess at any, the point is why can’t we pull more soldiers into this healthy war where world unites to show their physical talent and strength to capture medals and pride. It was something surprise at ending of the opening ceremony is to praise the torch. The secret behind the highlight of the show, after the complete round eyes opened wide to spot of lighting torch. The ingenuity led by them raises here at top of the bird’s nest. Happy Olympics, let sent peace everywhere and positive spirit across. Everything seems indifferent, the people, life, things, surrounding, relations, neighbors… but still minds different. Mind wakes in feeling special everyday being together, life with more pleasure, but what thought is ‘sky is blue and those are passing clouds may not cool always’. What makes me shine higher and secure put in slide when life returns normal. Back from uncle’s place and my native home, getting over all the rituals of great grandmother. Never before it was being very closer with my cousins and our family the days staying with them, off from system and television there is more to chatter and recall memories, and the experience brings more patient and comforts to mind made me lack courage leaving those away. We talked for day and nights, played till bored what gets me out of sorrow. Everyday sights a difference scene from my balcony, the lazy afternoons breezes across moves with chatting and reading books, looking for cousins arriving from schools, and the neighbors visit are some near moments missed for few years. Some difficult moments are when people shook about grandma’s sudden depart come in expressing there memories and her state of presence in mind, even the silence moments relates grandmother’s lose and really it not console her lose. There are few sleepless nights, tears buried inside with some smiles that granny was rested peacefully without more pain and suffer. She was wished to meet many people when she was alive, but even letting known her desire people refuse allowing there timing to visit her and I suppose to think here what life is then if one can’t turns when they are alive and whatever one do is useless when they passed. To tell simple excuses just like that people, but to be honestly the expression was in anger and hurts more that people not care later they grown and turn back who gives important. I wonder how much people well know by granny, its simple great learning her excess aid in past when people recall it. At same time i feel disturb when there are people too to forgive and forget her care and affection she truly got never turns knowing her last message, and more being away from her last moment when she was lifeless. I just keep in mind always I never forget the path I came across and people I meet in my life. What the next moment is unknown, the much known are before and near, but moving further like a stranger knowing never before hurts more. I feel it’s useless when talking about the past and not sharing with them the moment they are alive and never express what they are doing is greater and showing affection when they can sense. Being together with all I wasn’t felt lost of my grandmother; only to return home the loneliness and craving derives. Till last moment I want to extend my stay with cousins as much I become closer with them and at same time I need to comfort my parent handling myself. It is the rite of them tied these days, and thank to what I disbelief helps to understand what is in their mind and I never see my cousin bro request me like that to stay with them together. I was in absent of words to express my stage and I don’t know how to begin which is something I stumble in my life ever. Entering home I was like empty hands, nothing connects to mind and refuse to concentrate at anything with feel of loneliness around. Hope I visit all your blogs soon… and thank you so much for those consoling comments dears.